Our spacious facility includes 40 kennel runs and many separate fenced play yards to accommodate different sizes and play styles. Our kennels provide each dog with a 4 ft by 14 ft run. The climate controlled indoor portion of the run includes comfy bedding and a Pet Cot. The covered outdoor patio portion is equipped with large ventilation fans to keep your pet comfortable. We do close patio access at the end of the day and during inclement weather, keeping your pet safely inside at night and away from extreme outdoor temperatures and safe from country critters. 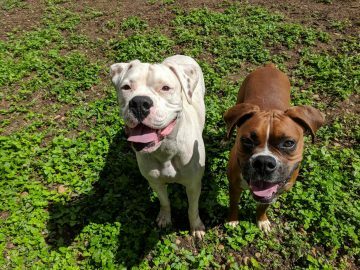 Each dog receives exercise in our spacious play yards either in supervised group play periods (if your dog gets along well with others) throughout the day. Pets that aren’t candidates for group play will get individual play times one-on-one with a staff member. We prefer that each guest bring their own pre-packaged meals. Otherwise, FROMM Classic Dry Kibble is served, at no additional charge. For the well-being of all dogs in our care, all dogs must be current on Rabies, DHLPP, Bordetella vaccinations. The most current receipt from your veterinarian may be emailed to onioncreekkennels@gmail.com. Otherwise, current vaccination records must be present upon arrival. Overnight dog boarding is $38.00 per dog per night. A package of 10 dog boarding nights can be purchased in advance for $340. Second dog or third dogs boarding in the same kennel run will receive a 10% discount on their stay. An additional fee of $22 applies for dogs picked up after 1:00 PM on their departure date.